When the Society was presented with the National Humanities Medal by President Barack Obama in 2014, the citation stated it was for “safeguarding the American story.” Now we are embarking on a building expansion project that will strengthen our ability to be the premiere library of record of pre-twentieth-century American imprints. 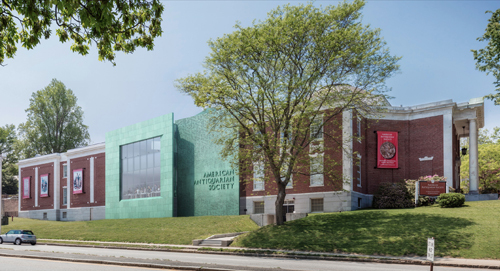 This new three-story, 7,000-square-foot addition to Antiquarian Hall will dramatically increase our capacity to preserve and to share the multitude of American stories documented in the printed record of our nation’s past. It will feature a mechanical room to house a modern HVAC system, ensuring high-quality climate control for collection preservation; a flexible multipurpose room for programming; and a state-of-the-art conservation lab. The façade of the addition will present a welcoming face to the community, literally opening up a portion of the historic library to view through a glass and patinated-copper façade facing onto Park Avenue, one of Worcester's busiest thoroughfares. In keeping with the most current thinking in historic preservation, the addition will have a distinctly modern flavor that nevertheless ties in with elements of the existing structure. With enthusiastic approval from both the AAS Council and the Worcester Historical Commission, we are ready to take this step towards making our third century our best yet. The new copper-paneled façade—nestled in a large niche between existing Neo-Georgian blocks. Rendering courtesy of Samuel Anderson Architects.